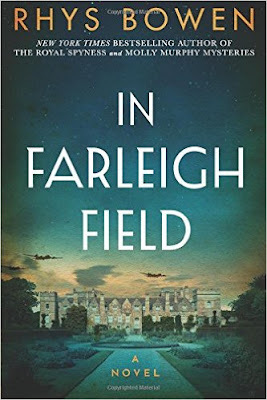 I was thrilled when I was asked to read Rhys Bowen's newest mystery novel, In Farleigh Field. Out March 1st this was a very powerful and moving story that made World War 2 come alive for me. The bombing, the rationing, the chaos, losses, the personal sacrifices and triumphs. Rhys Bowen has written a fascinating mystery about a terrible time in history and has still managed to give it that wonderful historical cozy feel. Her descriptions of people, places and events of the time feel very real. She captures the sense of loyalty, duty and betrayal most splendidly. This is a book that will stay with you and one you will not want to put down. This is one not to miss. 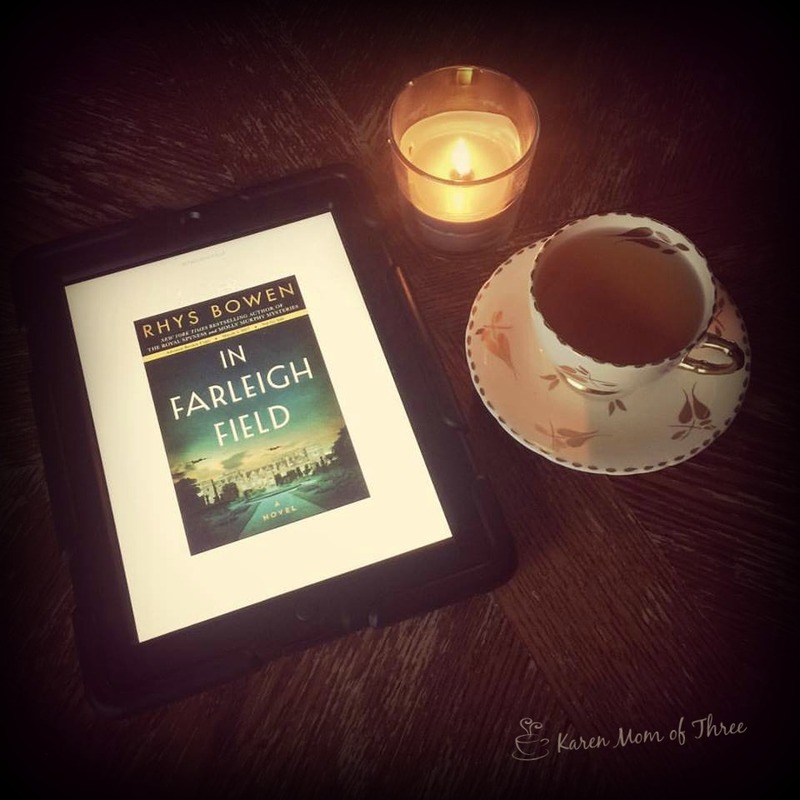 To order your own copy of In Farleigh Field by Rhys Bowen from Amazon please click here. Learn more about the works of Rhys Bowen by clicking here. Last week on a website I enjoy called Mental Floss, I came across these fun teas and tea tins in the shape of books. Immediately going on my wish list how about you? 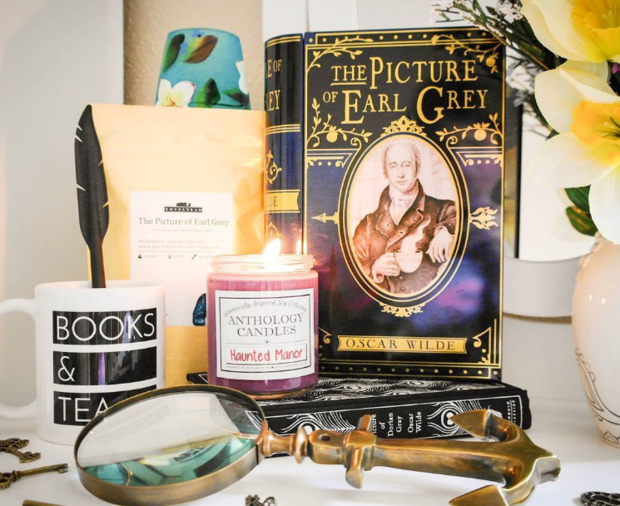 Honestly if you are fan of literary works and teas or are a gift purchaser for one you will want to keep these in mind for the holidays for sure! The company behind them is called Novel Teas! 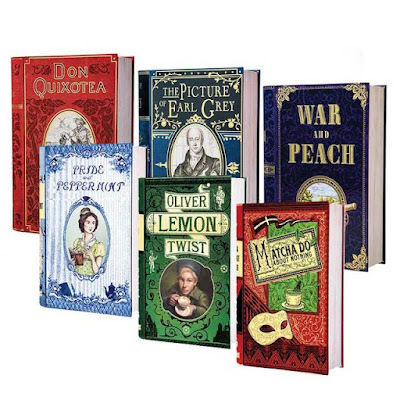 I would love the "Pride and Peppermint" as well as "The Picture of Earl Grey"
You can learn more about them from visiting the Novel Tea Tin website by clicking here. Read the Mental Floss article here. Today I am sharing a bit about author Gilian Baker and her new book Blogging is Murder. Thank you Gilian for joining us today. KMOT: When you are writing what sustains you? Coffee, Tea other? GB: Can I have both, Karen? ☺ Coffee in the morning, and then sometimes I switch to iced or hot tea in the afternoon. It doesn’t have to have caffeine; it’s the flavor I go for. I also drink a ton of water to stay hydrated. KMOT: What gave you the idea for your series? 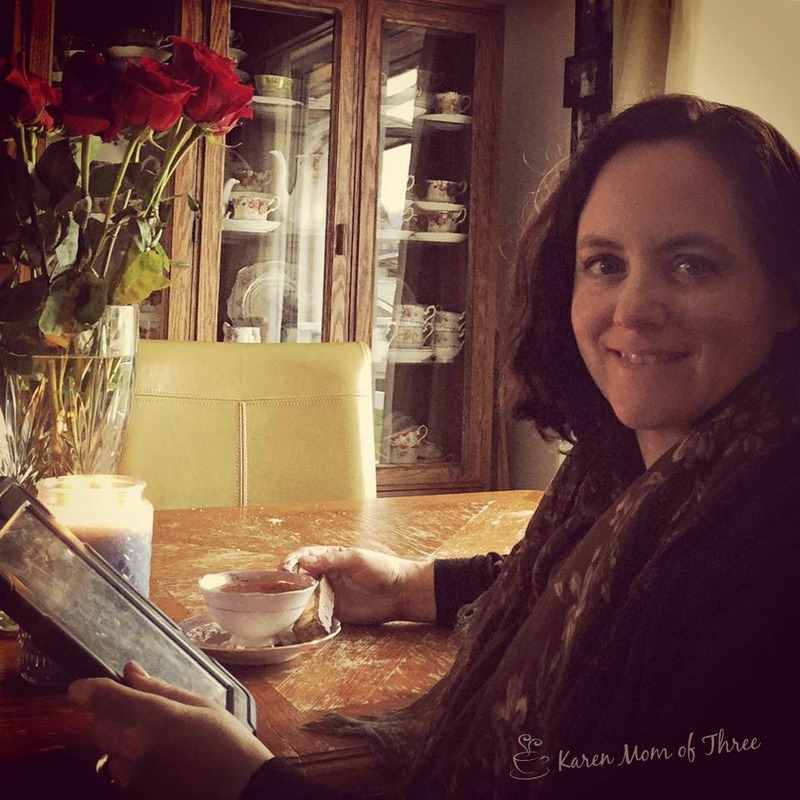 GB:The basic idea grew out of my frustrations with blogging. I knew from the comments I saw all over the Internet that most bloggers had those same hardships. 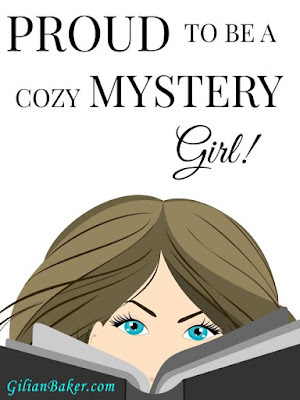 The idea of a blogger being a cozy mystery protagonist popped into my head. It’s a great job to have if you want to be an amateur sleuth, which I always had. Cyber-stalking was a natural progression—there are weekly news stories about big or small businesses getting hacked. I put my own spin on the idea for the plot, but I thought cyber-security would be a good hook. Everyone, not just online entrepreneurs, worries about their online security, or they should. KMOT: How long was the writing process? GB: That’s hard to answer because I started writing Blogging is Murder as a hobby. Actually, I started it as a NaNoWriMo project in 2014. After NaNo was over, it fell by the wayside, even though I loved writing it, because there was “real work” to be done. Two years later I decided to publish it. Once I made that commitment, it took around five months to get it ready for publication. I learned a lot about the process that first time and plan on releasing four books per year from here on out. KMOT: Who is your biggest supporter when you write? GB: I have so many supportive people in my life that it’s hard to choose just one. I’m so blessed. My husband and daughter would definitely have to be at the top. Since I live with them, my writing impacts them the most. My husband is great about supporting me, even though financially it’s been a challenge. My daughter is also a writer, so she’s a great help. I know I can always go to her for a pep talk and a brainstorming session. She never steers me wrong. I also have several close friends who read drafts, brainstorm idea and encourage me when I question myself. Even my parents have been very supportive. You know, as a parent, you want your child to be safe and secure. Happy too, for sure, but there’s always that fear that they will take too big a risk and won’t land on their feet. So when my parents got behind me that was really exciting! 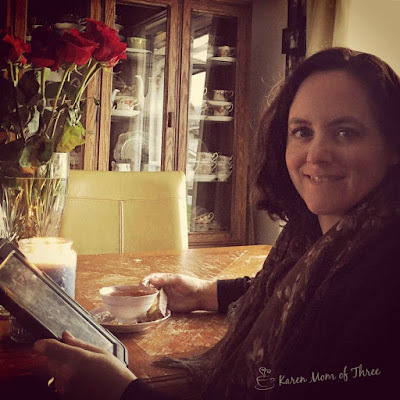 KMOT: What would you like my readers to know about you? GB: I’m an eccentric Aquarian and proud of it. I’ve always been about reading and writing. For most of my adult life, I was an English professor. When our daughter started college, I gave into the itch to do something new, so I started a blog for college writers. That led to ghostwriting, among other things. But I’ve never been happier than when I can sit in my “writing chair” and plot murder! I love the plotting, brainstorming, writing and editing. In other words, I’m a born writer. I’m happily married and have a brilliant daughter, who is also a reading and writing geek. We spend many happy hours discussing literary theory and the classics. I love to grow my own food and knit. If I could do anything, I’d write cozy mysteries. Thank you for joining us here today Gilian. Click here to learn more about Gilian Baker on her website. Find and like her on Facebook by clicking here. Another week has come and gone and so much reading has happened this week. Upon my table this weekend is Laura Childs Pekoe Most Poison, I could not wait until my hardcover arrives and dove into this advanced reading copy. Book number 18 in this amazing series. Thinking of my good friend who this weekend is on her way to Mardi Gras this weekend and celebrated this wonderful cozy last Sunday on my blog. 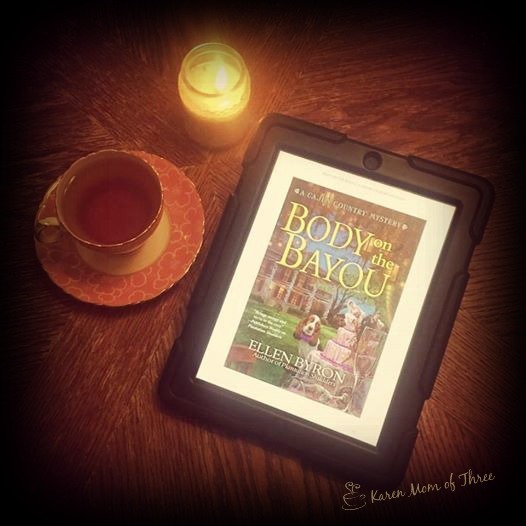 Body on the Bayou by Ellen Byron was brilliant and one I did not want to end. I highly recommend this book! This week I shared 4 cozy mystery short stories all that were free on Amazon this week. 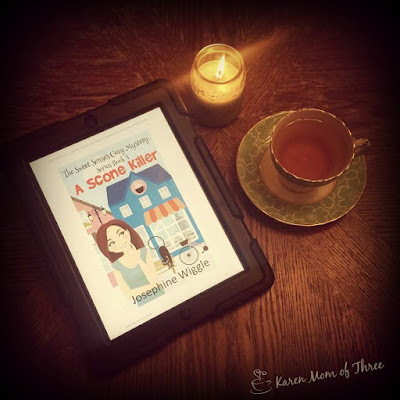 A Scone Killer by Josephine Wiggle, about a new tea shop was a perfect choice for me and I think you will like it too! 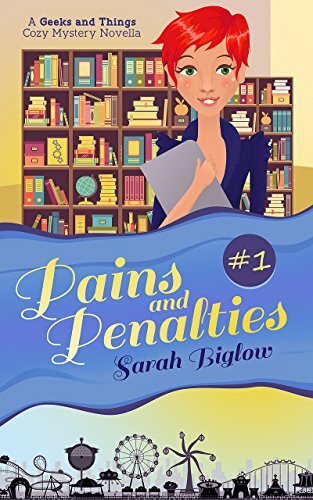 Pains and Penalties by Sarah Biglow was up next and this very cool cozy is set around a comic book store owner. I enjoyed this one and look forward to reading more in this series. Ghost in the Coffee Machine was so good I bought the series! Charity Tahmaseb has written a series of paranormal shorts, the first one shown above was so good I knew I had to read more. I down loaded the first 5 stories. I love that I have them waiting for me on my kindle app. 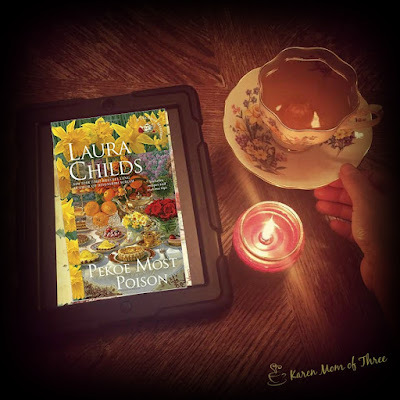 Friday I shared about how much I loved how A Cue to a Kill was presented, not having read any in this series I did not know what to expect, but it was wonderful and I am thrilled I have another in the series on my kindle app to read as well! 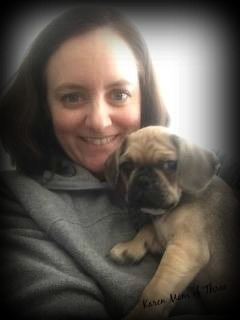 This week I had the pleasure of daily puppy sitting/visiting my new "niece" 9 weeks old and cute as can be, our cats were not thrilled to make her brief acquaintance but the boys think she is pretty cute. Visiting her daily at my sister in laws has been fun. 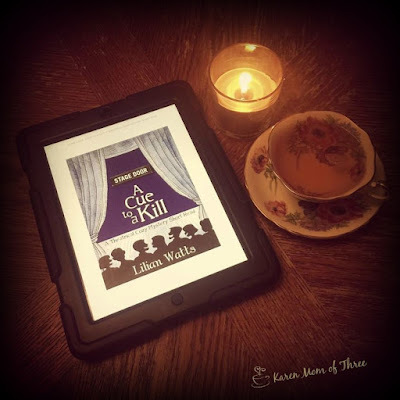 Friday already and I am sharing my review of A Cue To A Kill by Lilian Watts. I found this on Amazon earlier this week and read it on Wednesday night. 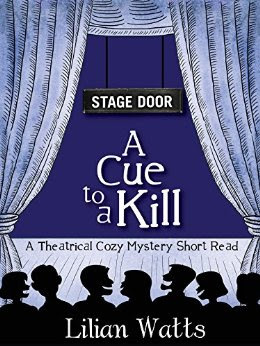 This cozy short mystery focuses on a group of actors on the final night of their most recent production and mayhem begins backstage just before the curtain rises. I enjoyed the story told from the point of view of the props manager and found the mystery a fun and easy read. Perfect for someone who is looking for an hour of good reading and a pot of tea, just like me. Lots more in this series and I would absolutely not hesitate to read more. Great fun. Just like the other cozy short story reviews I have shared this week, at the time of posting this mystery is FREE on Amazon. Backstage at the last night performance of the murder-mystery play "Bone Chiller," a real life killer is stalking the corridors of the theater.The Goose Meadow Bay Players' Halloween production has been declared an artistic success by enthralled audiences, but onstage and backstage the cast and crew are just a little bit bored. On the last night, one of the actors has a great idea to liven things up and everything seems harmless enough, but then an attempt is made on one actor's life. Not long after that, another goes missing.With the audience's laughter ringing in their ears, the cast are more intent on stardom than finding the potential murderer lurking amongst them. Can Kath keep the show running, the cast safe and make sure the killer sticks to the script? You can download your own copy of Lilian Watts book A Cue To A Kill on Amazon by clicking here. Learn more about Lilian Watts and her work by clicking here to visit her website. I think I found a fun new guilty pleasure! This is another of the cozy short's I found this week free on Amazon and I have had to buy the series! 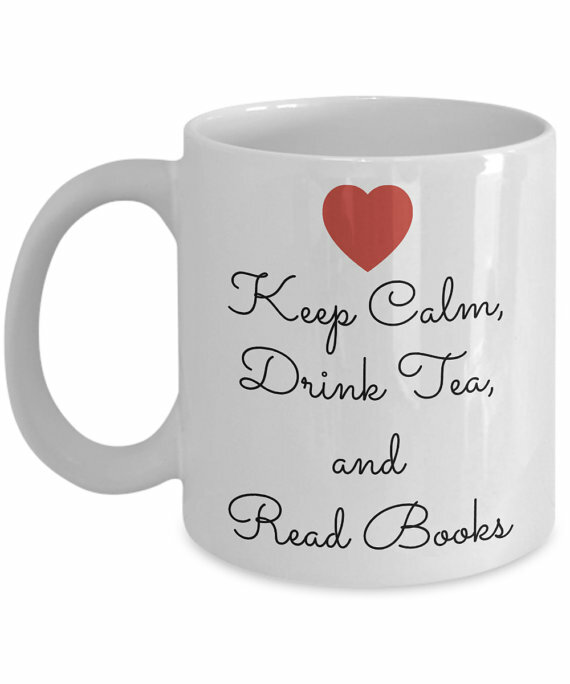 Such fun and in such a perfect size for tea breaks (coffee breaks) or just reading on the go. Charity Tahmaseb has written several paranormal cozy shorts about a ghost hunter who uses coffee to draw out the ghosts she catches and releases. I loved the first one Ghost in the Coffee Machine and I have to say I bought the "first season" series of 5 books last night. The first one caught me from the start and the teaser for the second book sealed the deal. This is a very interestingly presented series in that each is presented as you would expect tv or mini series episodes. I think it is brilliant and loved it so much I invested in the series. At the time of this posting you too can down load this lovely first in series free on Amazon and I hope you enjoy it as much as I did! Katy and her grandmother have always used coffee to catch ghosts. It pays the bills and keeps them in high-end beans. But after Katy’s grandmother dies, it’s as if she’s taken all the ghosts with her. 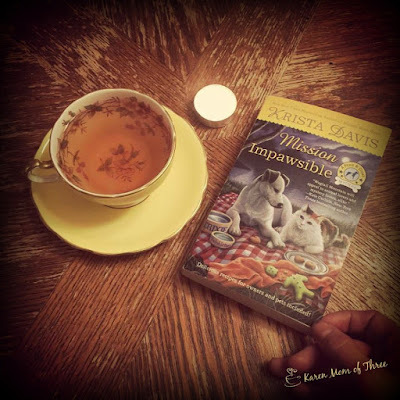 Until Katy discovers there’s a rival ghost hunter in town, one who uses tea--of all things--and one who has stolen all her clients. But when an epic infestation threatens, Katy can’t help but get involved. It will take all her wits--and some excellent Kona blend--to fight the ghost in the coffee machine.Ghost in the Coffee Machine is a short story of approximately 4,000 words. The story was first published in Coffee: 14 Caffeinated Tales of the Fantastic. This story is now the pilot episode for the Coffee and Ghosts serial. 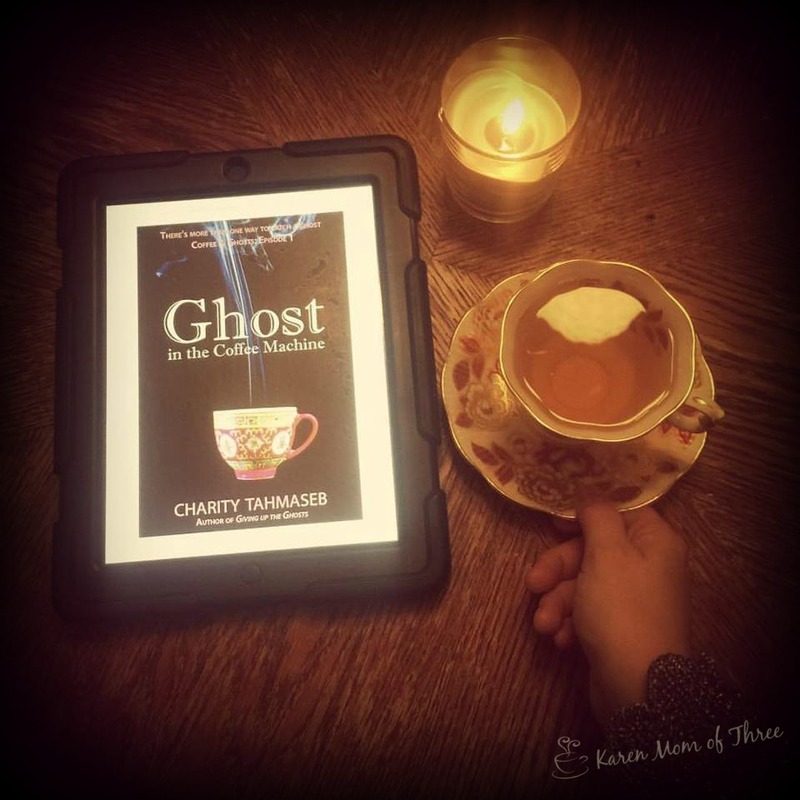 Coffee & Ghosts is a cozy paranormal mystery/romance serial told over multiple episodes. Ghost in the Coffee Machine is the pilot episode. 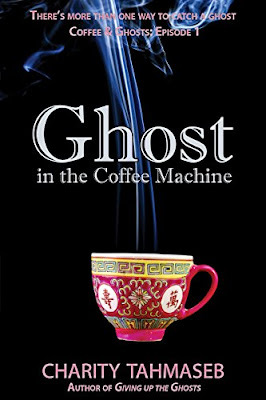 Download your Kindle Copy of Ghost in the Coffee Machine from Amazon by clicking here. Learn more about Charity Tahmaseb when you click here for her website. 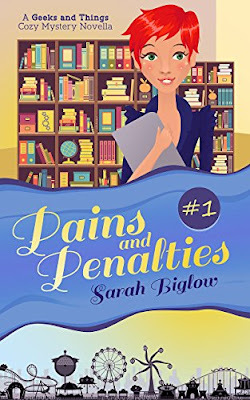 I found Pains and Penalties by Sarah Biglow on Amazon when I was searching for a cozy mystery to read yesterday morning and this one had everything I was looking for and so much more. At the time of publishing this cozy novella is FREE ON AMAZON. 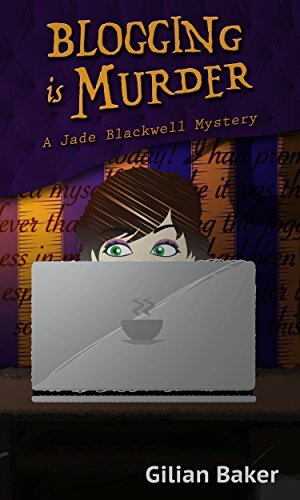 This is the first book in the Geeks and Things Cozy Mystery Novella Series. 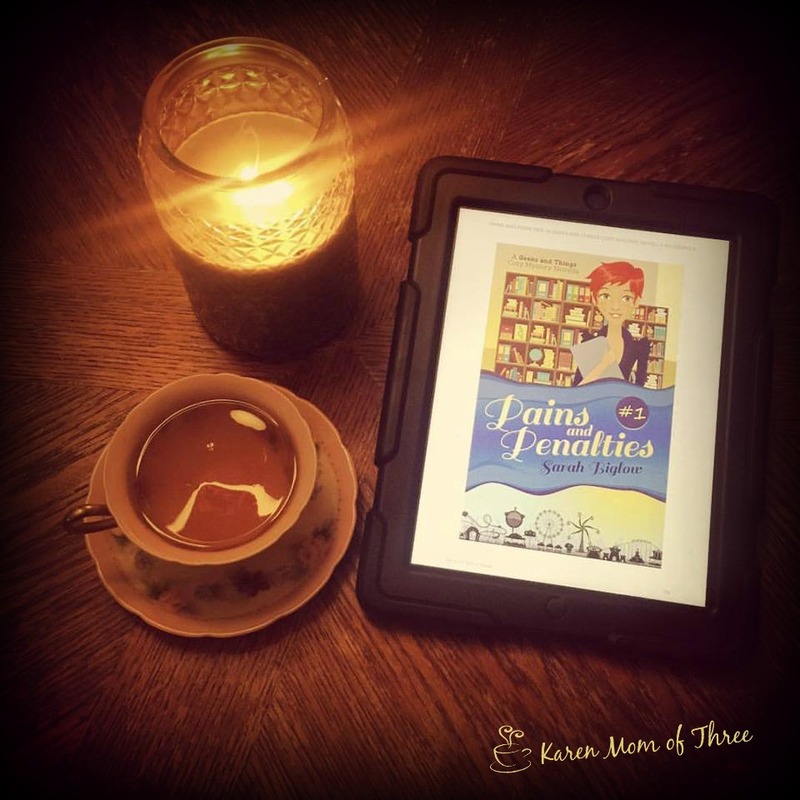 I was thrilled to find this series is based on a comic book store owner and I found this fast paced cozy was very well written. A great mystery awaits you that was very interesting and wound neatly around the story. I loved main character Kalina's relationship with her nephew as well. I believe this shorter story will appeal to many cozy mystery fans. I am so glad I found this series and I am looking forward to reading Toil and Trouble which I just downloaded free with the subscription to Sarah Biglow's Website Newsletter. 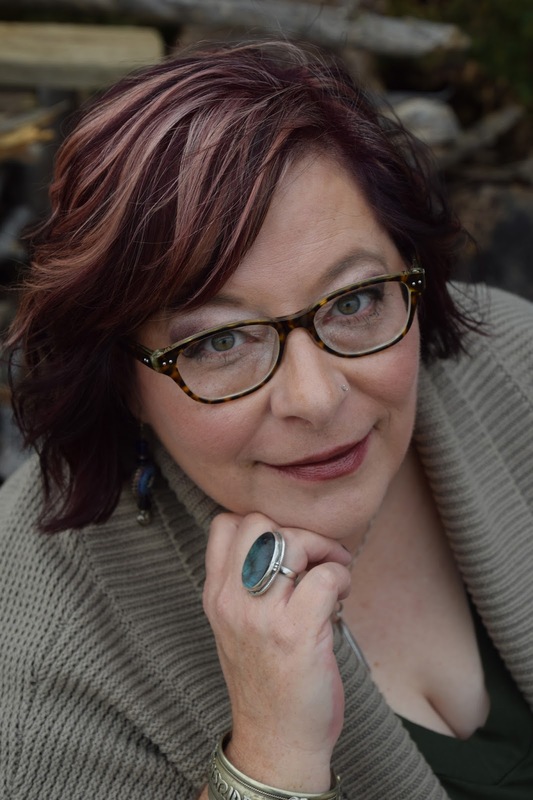 Click here to visit Sarah Biglow's Website to learn more about her writing and where you can get Toil and Trouble. Monday's are my crazy busy days. I run from 6:30 am to 9:00 pm with about 12 round trip car journeys. I was waiting on a few books to arrive and when they did not I down loaded this FREE at time of posting cozy mystery by Josephine Wiggle. A Scone Killer is part of a trilogy and book one is right up my alley as it is about three friends who open a tea shop. Already I knew I would like it. In its 50 pages this cozy was able to draw me in and very much entertain me while I taxied from place to place. I really enjoyed it and the twist at the end was also a very nice touch. This book is a little gem! Ingloriously fired from her finance job after trying to blow the whistle on her sleazy boss, Laura moves back to her hometown of Harrodsburg, KY, and immediately runs into two of her childhood friends, Emma and Alex. Emma, who has never left her hometown, is coping with a recent divorce, and Alex is reeling from the breakdown of his small business—and the smear campaign his former business partner is running. When he mentions his dreams for opening a small tea shop (dreams that have been shattered by his lost business), Emma and Laura pile one, keen to go in on the project. However, on the day of the opening, the body of Alex’s former business partner is discovered…and Alex is now the prime target. Out of loyalty to her friend, and a burgeoning romance, Laura resolves to find the killer—but can Alex be trusted? Download this book to your kindle app free at time of posting by clicking here. Very few cozies move me to tears. 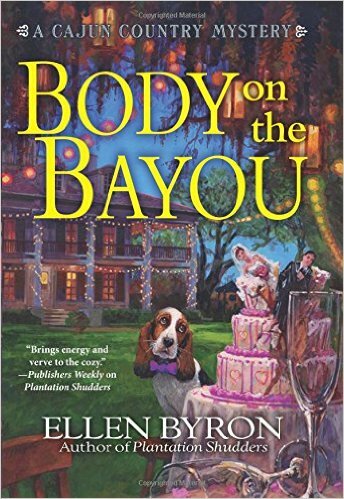 Body on the Bayou by Ellen Byron is exceptional. 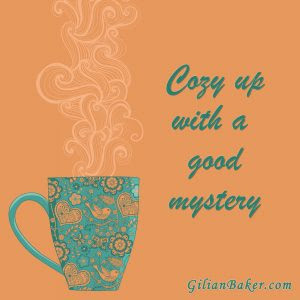 It is a cozy that has that right balance of what you love in a cozy mystery, a crazy set of circumstances and an incredible dose of reality. I loved this book. Maggie (Short for Magnolia) is a character I could immediately relate too, she was easy to get behind and felt like she would make a really great friend. The relationships in this book are wonderful, and what I would expect from a southern based cozy, tons of loyalty and a touch of crazy, a seamless blend and the perfect balance. I truly appreciated the story line of the relationship with Maggie and her boyfriend's son. With out giving too much away the character has Autism and as a mom with kids with Autism, this story line felt incredibly authentic. As it touches me personally, when I come across characters in cozies who are supposed to be on the autism spectrum I am often unhappy with how the author writes that character, not in Ellen's book though. I feel as if she had a true understanding of what it is like to love and support a person on the autism spectrum. She was able to normalize the true relationship with out making it feel negative or unfeeling. I felt her story line was a great service to our community and I will be forever grateful. I loved the mystery, the way she wrote the victims was perfect. I had no idea who the real murderer was until the big reveal. Surprising and comedic twists through out. This was the perfect Sunday read. This is a book I would and will buy my friends to read. 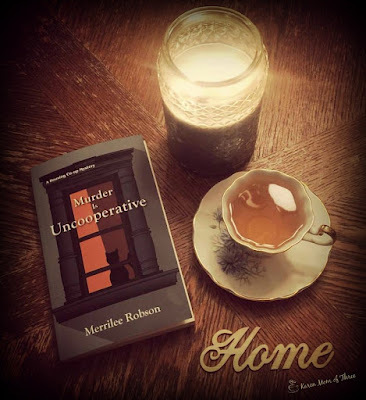 The Crozats feared that past murders at Crozat Plantation B&B might spell the death of their beloved estate, but they’ve managed to survive the scandal. Now there’s a très bigger story in Pelican, Louisiana: the upcoming nuptials between Maggie Crozat’s nemesis, Police Chief Rufus Durand, and her co-worker, Vanessa Fleer.When everyone else refuses the job of being Vanessa's Maid of Honor, Maggie reluctantly takes up the title and finds herself tasked with a long list of duties--the most important of which is entertaining Vanessa’s cousin, Ginger Fleer-Starke. But just days before the wedding, Ginger’s lifeless body is found on the bayou and the Pelican PD, as well as the Crozats, have another murder mystery on their hands.There’s a gumbo-potful of suspects, including an ex-Marine with PTSD, an annoying local newspaper reporter, and Vanessa’s own sparkplug of a mother. 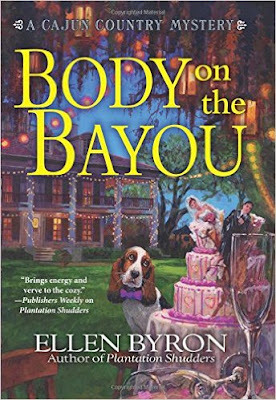 But when it looks like the investigation is zeroing in on Vanessa as the prime suspect, Maggie reluctantly adds keeping the bride-to-be out of jail to her list of Maid of Honor responsibilities in Body on the Bayou, Ellen Byron's funny and engaging follow up to her critically acclaimed novel Plantation Shudders. 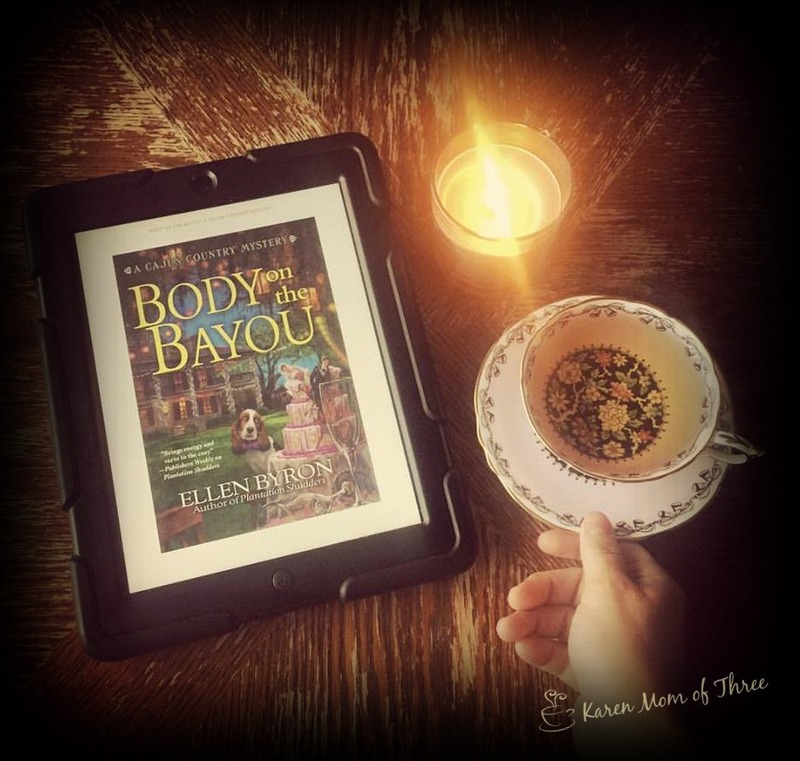 To order your own copy of Body on the Bayou by Ellen Byron from Amazon please click here. Learn more about this series and author Ellen Byron by clicking here. 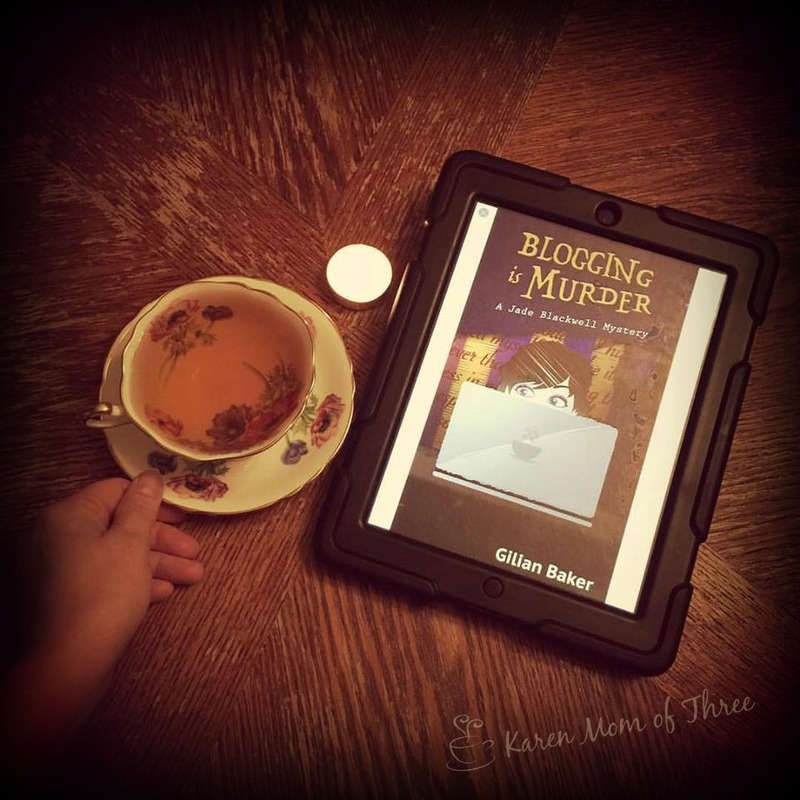 Blogging for Murder by Gilian Baker is out today and this "Blogging Based" mystery had my attention for sure. This was a clever and excited cozy mystery with great twists and turns. A first in series that I am sure you will enjoy. Characters are easy to like and very easy to get behind. This blogging mystery had me thinking about my own internet safety and all the work I put into my own blogs. A book that will stay with you for sure. Set in mountainous south-eastern Wyoming, Jade Blackwell lives in a log home in the quaint village of Aspen Falls with her husband, Christian and daughter Penelope (Ellie). She left her life as a tenured college English professor at the University of Wyoming four years ago, sick of the bureaucracy, mounds of essays to grade and apathetic students. She turns to blogging and ghostwriting as her new career. An exciting thrill ride from the first page, to the last. Read Gilian Baker’s Blogging is Murder, the first book in the Jade Blackwell cozy mystery series! You can order Blogging is Murder from Amazon by clicking here. Learn more about Gilian Baker by clicking here. Greetings from my table here on the West Coast. 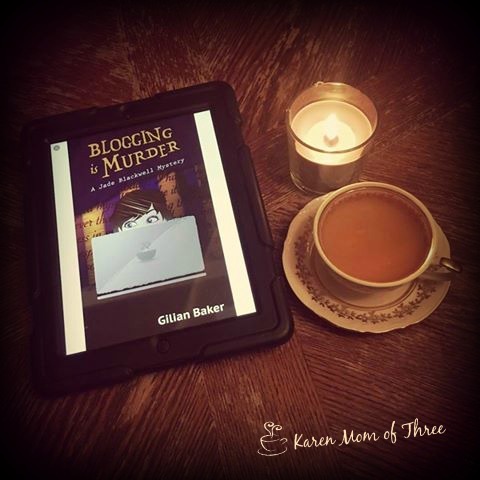 This morning I have Blogging is Murder on my table this weekend by Gillian Baker. 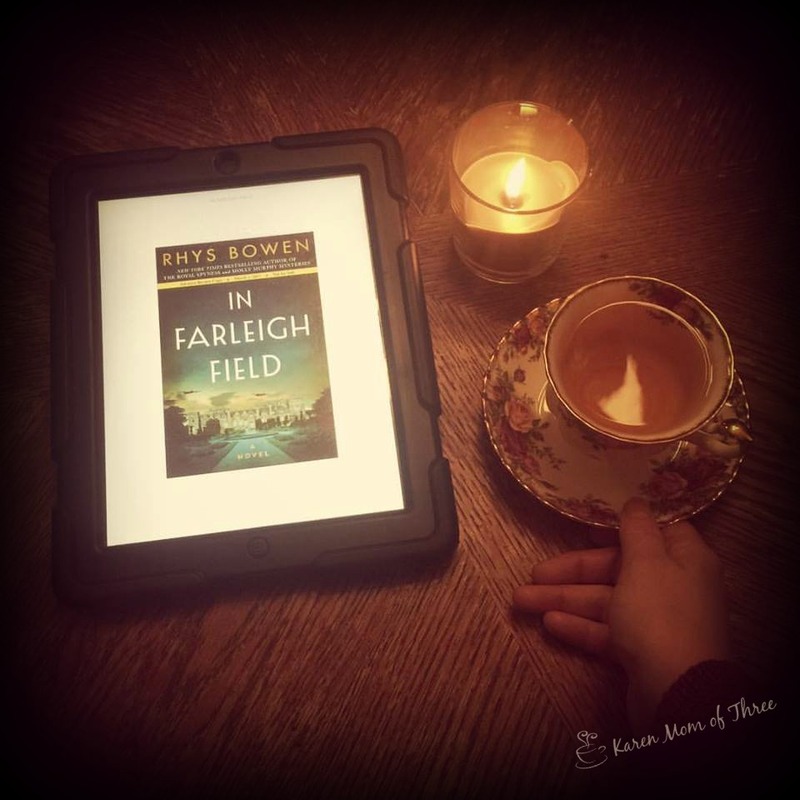 It is an interesting read having a series about someone who blogs. 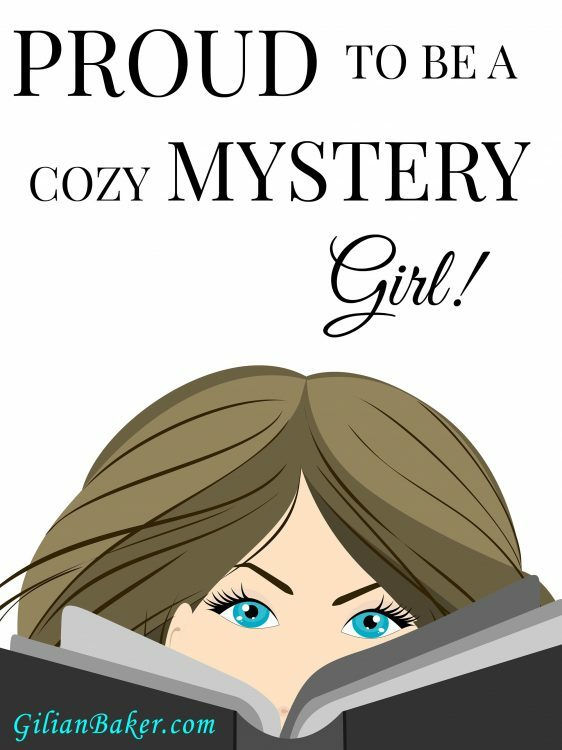 I was so excited to get messages from my friend and fellow nominee Lisa K along with my friend Karen as I was nominated as one of A Cozy Experience's Top Ten Cozy Mystery Blogs, you can view this post and check out some amazing blogs I feel very honored to be considered among these wonderful writers. Click here to read the article. 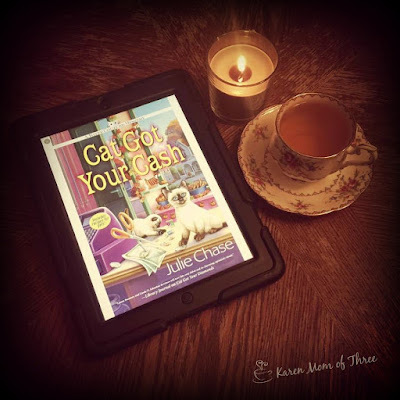 I was thrilled to read Cat Got You Cash by Julie Chase this week. I so enjoyed this series and I know you will too, this is an April release you wont want to miss. A visit with Sid this week was just what I needed. 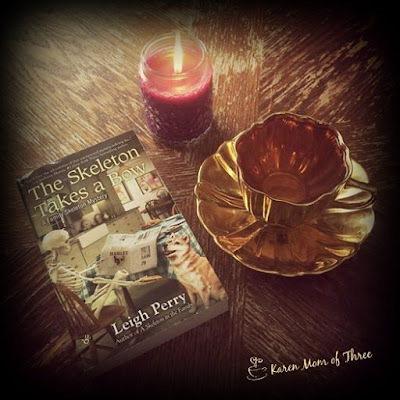 I love this series by Leigh Perry and if you have not checked it out, trust me you will grow to love him too. 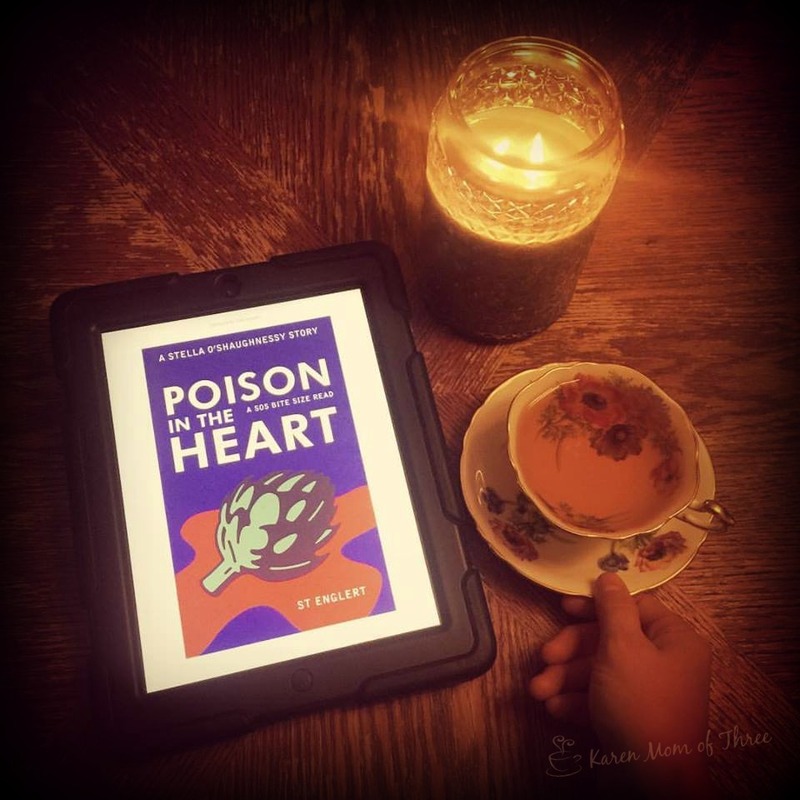 An adventure bite sized cozy read Poison in the Heart a pot of tea and a quick read this is a great lunch or tea time read. I am looking forward to the next one! Reading a Vancouver BC based cozy was also a highlight to share this week. I love the idea that where I live is highlighted in such a way. 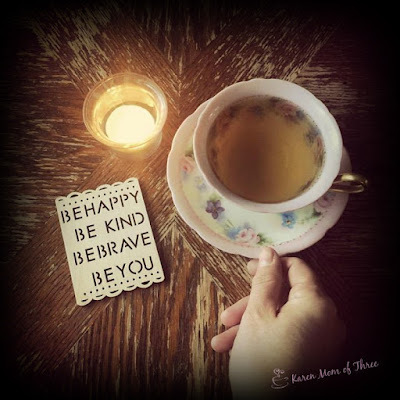 In my cup this week I have had my regular Murchie's Vanilla blend but also tried the Harney & Son's Valentine tea, which is a lovely chocolate rose tea as well as having Jasmine tea this week almost every day. 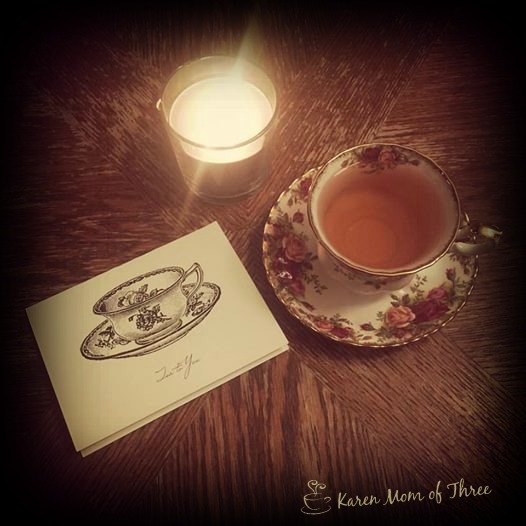 I got this beautiful card in the mail this week with the surprise delivery of the tea and lovely tea cup and saucer. I may have to frame this I love it so much. I am a bit under the weather so I did not get all that I wanted read to review for today, so I ask your forgiveness as I share today's post instead. I was very excited to find a box on my door step sent by a lovely reader who has become a friend. Lin sent me this cup and saucer she picked up at World Market and some lovely teas! I also got a few of my favorite Walkers shortbread cookies which were such a delight to have with my tea. 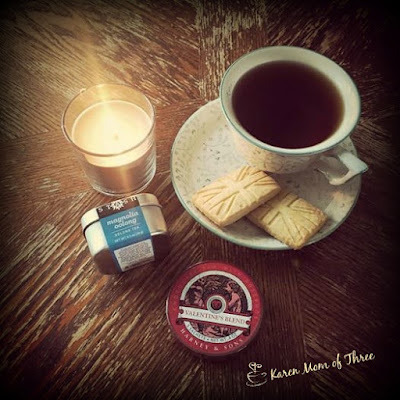 The Harney & Son's Valentine tea is a lovely blend of black tea, chocolate and rose. 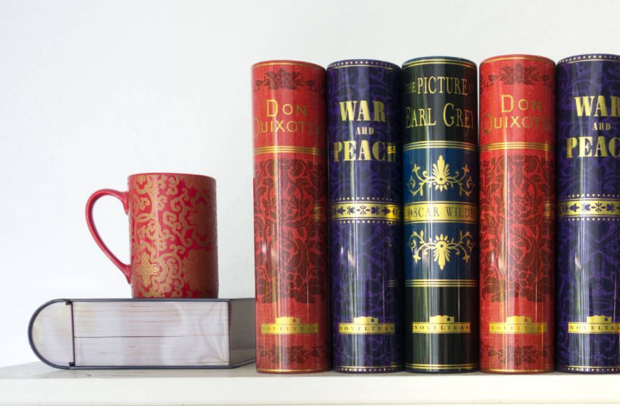 The beautiful tin is perfect for your tea on the go or desk and 5 tea bags to enjoy. I have not yet tried the Oolong but I am looking forward to that as well. 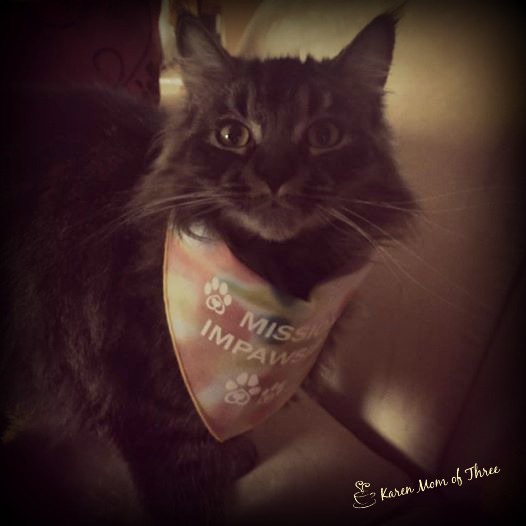 Miss Mia sports a pretty bandanna sent by author Krista Davis. Both cats have been very excited to have gotten this lovely surprise in the mail. I did not want to put this one down! 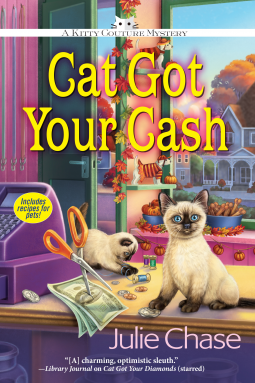 Cat Got your Cash by Julie Chase is a second in series that was every bit as good as the first. I loved it. This Kitty Couture mystery was wonderful. It has the right formula for cozy lovers and just a hint of romance mixed in with a whole lot of crazy mystery. 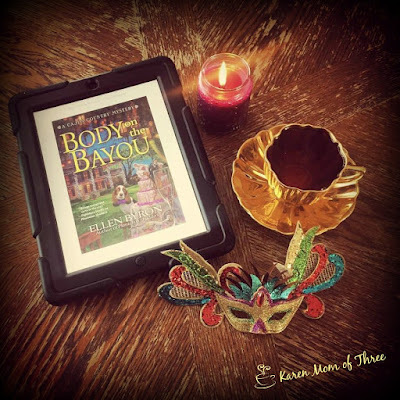 This one is set in New Orleans and makes it seem just like you are there. Easy to picture, fun to think about and a great story. I love the main character Lacy, her friends, pets and family. The woman bakes and creates for animals, not truly going out of her way to be a super sleuth but she is "nosy" for sure. I enjoy this series and book two was great. I can not wait for you to read it. Out April 11th, this is a must read. Lacy Marie Crocker’s whimsical pet couture has gained a following in New Orleans’s cozy Garden District, and word of mouth has traveled all the way to her favorite fashion designer, Annie Lane. Lacy’s thrilled when Annie schedules a private session at her home to discuss a companion line for her evening wear, but when Lacy arrives for the appointment, she enters the kitchen to two mewling Siamese cats--and one very dead Annie.Lacy takes the kittens home to care for them until they can be properly claimed by Annie's family or friends, but after a busy day of work, she returns home to find them missing. 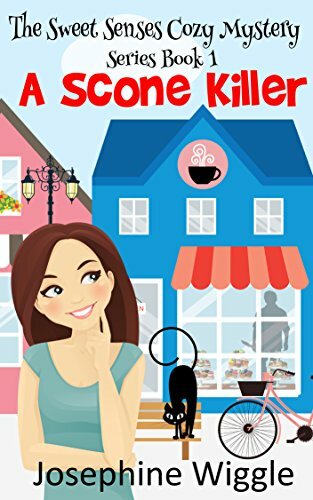 And when Lacy learns the cats are set to inherit Annie's fortune, she begins to wonder if the killer was after the kittens all along. Now Lacy will stop at nothing to save the Siamese and find justice for Annie--if the killer doesn’t sink his claws into her first.Luckily, Lacy has the help of handsome NOLA PD homicide detective Jack Oliver to help her catch the cat-napper before its too late in Cat Got Your Cash, the endearing second Kitty Couture mystery from Julie Chase. You can pre order now on amazon by clicking here. Learn more about Julie Chase and her series by clicking here. 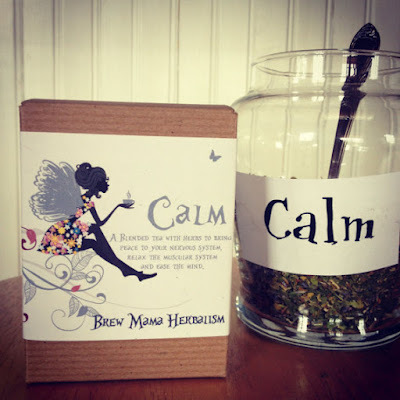 I have not been enjoying the book I was reading and was planning on reviewing today so instead of giving a poor review of the book I have decided to share three mid week calming gift ideas for yourself or someone you love. When I read a book I don't like I don't rush to share my reviews or publish a bad review because I feel like as a reader I put a lot of effort into reading what I could and the writer put in all that they had and for what ever reason it was just not the right book for me at the time. So today I share three Etsy favorites with you instead. First one I came across that caught my eye was this blend by Brew Mama Herbalism. The packaging caught my eye and the 100% Organic Ingredients-Chamomile, Lavender, Passion flower, Skullcap, Red Clover, Catnip, Dried Orange Slices appealed to me as well. Click here to learn more about this shop and listing. If you prefer to soak in your tea then check out Tea Time Just Calm bath by Parlo Cosmetics. This bath is handmade with lavender, milk, honey and more. 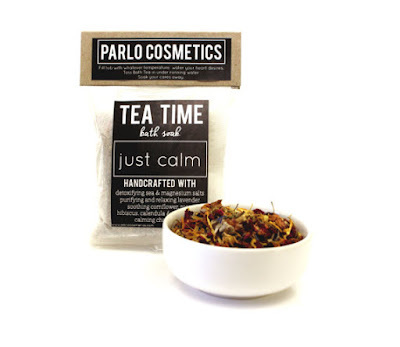 Click here to learn more about this calming bath. I also really liked this mug offered Schroeder Designs , they had a bunch of really cute sayings but I was quite partial to this one. Click here to see this listing and check out their shop. I am very excited to start reading Cat Got Your Cash by Julie Chase! This one is out in April and is the second in the series. I loved the first one so I am thrilled to get an advanced reading copy!